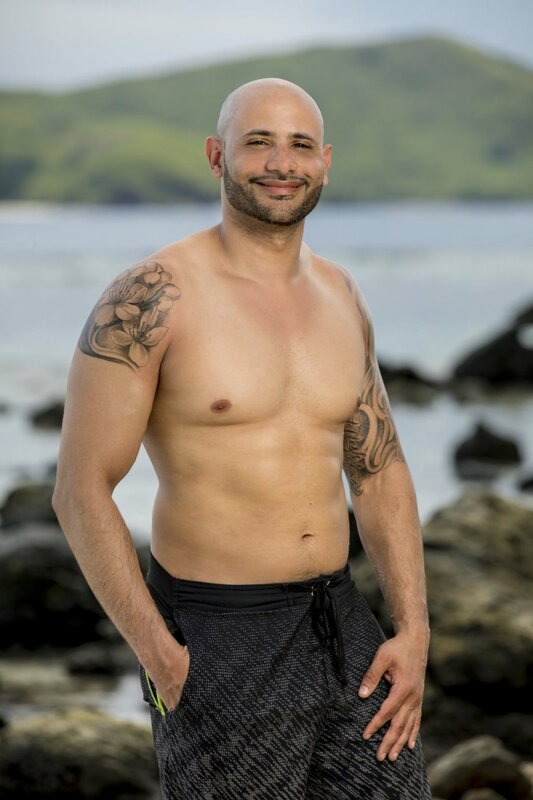 Joe Mena was voted out of the Solewa tribe on Survivor: Heroes vs. Healers vs. Hustlers' two-hour episode Wednesday night on CBS. After JP Hilsabeck was sent packing, Joe, a 34-year-old probation officer from Bronx, NY who currently resides in Tolland, CT, became the eleventh person voted out of Survivor's 35th season and the fourth member of the jury on Night 30 of the game through a 4-2-2 vote at Tribal Council. Ashley Nolan received two votes from Ryan Ulrich and Chrissy Hofbeck, while Ryan earned himself two votes from Joe and Mike "Dr. Mike" Zahalsky. "They definitely got me. It was a good call on their part," Joe said following his ouster. "We had an alliance of five, and obviously they really didn't want me in that alliance. They just needed numbers. But I played like I said I was going to play; I gave them 120 percent and I played aggressive." During an exclusive interview with Reality TV World on Thursday, Joe talked about his Survivor experience. Below is a portion of what he had to say. Reality TV World: Do you know why the majority of the tribe made JP the target when Ryan had an idol and you all seemed to consider Chrissy "a mastermind?" Chrissy, Ryan and JP never saw it coming, so getting rid of Ryan would have flushed his idol early on. Joe Mena: Yeah, sure! So, I mean, I was pulled into that alliance, you know? It's not like it was an alliance that I created. And I was well aware at that point of the type of players that I was playing with. So my pitch was like, "Alright, if you're going to use me and Mike, let's make a move," you know? They were just excited that they were actually playing and doing a blindside. I was like, "So who are you going after?" And they were like, "JP." And I was like, "What?!" So I was really pitching Chrissy and [Ben Driebergen], actually, at that point, and they were just resistant. I was pretty persistent, and they were just like, "No, no, no!" So I was like, alright, let me just fall back and play my position, and we went after JP. So I guess, I mean, [Lauren Rimmer] explained to me that he's a physical threat. In my mind, I'm like, "Well, Lauren, you're technically a physical threat! You've won Individual Immunity, you won the Reward, you know, you've done fairly well." But they just decided to go with JP. I think it was an easy vote, but most importantly, I think they were just excited about just making a move -- what they considered a move. To me, it was just like, "Alright, this is an extra three days for me." But I was definitely going after Chrissy or Ben at that point. Reality TV World: Going into the Tribal when JP went home, what were you thinking was going to happen? Did you think Mike or yourself was going home, or did you actually believe JP would be the one to go? How much trust, if any, did you have in the group you were working with? Joe Mena: I had no trust. I thought I was going home! I was consistent with how I had performed at Tribals, you know, I would always make some smart remarks. I wasn't sold on it. It was like an 80/20 split. I'm like, "Maybe they'll take him out," but I just didn't understand why JP. To me, JP was almost, like, a goat. He was someone whom you could kind of bring [along]; he didn't really do much. Why would you take him out? But on the flip side, I'm like, if they want to take somebody out from the other end, the other four -- Ben, Chrissy, Ryan and JP -- then maybe JP is the easiest. I wasn't completely sold, but once I saw JP's name come up, I was like, "Alright, we've got something here!" Reality TV World: Before the Tribal when you went home, Devon Pinto told Mike and yourself to vote for Ryan with him, while Lauren and Ashley would cast their three votes (utilizing the secret advantage) for Ben. How convinced were you that Ryan was going to play his idol and Ben was ultimately going home on the revote? Joe Mena: It was 80/20, but I was 100 percent sure Ryan was going to play his idol. They didn't show the relationship I had with Ryan and the fact I was going to play with Ryan and I was planning to just flip-flop. My goal was actually to take Devon out. My goal was to play -- and I mentioned it a little bit at my Ponderosa -- and my goal was to take Devon out along with Chrissy and Ryan. I was actually going to exclude Mike on that end, so I wanted Ryan to play his idol on somebody, whomever we were going to vote out, and then Ryan and Chrissy and I were going to vote out Devon. Unfortunately, that never came about because the alliance of five, they really sold me on this package deal that the idol was going to be flushed out and we were going to vote out Ben and the extra vote was going to be used. So I was pretty confident Ryan was going to play his idol. Devon told him to play his idol. I told him, I was like, "Listen, guy, we're putting votes towards you. To save yourself, just play the idol." But yeah, so, that's how that turned out. Reality TV World: So were you really blindsided then? It sounds like you had an idea you were the target. Joe Mena: Well, any time you're voted out, it's technically a blindside. I was 80 percent sure I was going home. But my gut was telling me to go, I mean, Devon didn't speak to me, Lauren was kind of cold towards me. I knew I was going home, but I was really hoping -- I was like, "I can't give this opportunity up! This is an amazing package deal. Ben's going home, the idol's going to be flushed, and the advantage is going to be used." I told myself, "Joe, play it cool. Hopefully this turns out for the best." Be sure to check back with Reality TV World soon for more from our exclusive Survivor interview with castoff Joe Mena. 'The Bachelor' spoilers: Who did Arie Luyendyk Jr. pick in the finale? And did he propose to his final bachelorette?